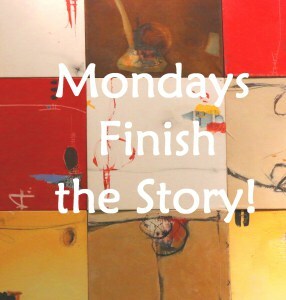 It’s Monday again, the day for Barbara Beacham’s excellent flash fiction challenge, Mondays Finish the Story. This asks that we write a piece of fiction in 100-150 words from the photo and first word prompt provided by our host. If you fancy having a go at this, click on the link above to get the instructions on how to post and follow the link to other entries. If you’d just like to view some of the other entries, click the link here. Here is this week’s photo . . . Dropping her line into Fool’s Lake, she patiently waited for something to bite. David considered the matter, deciding that his brawny sister would have no problem bashing his head to a pulp against the jetty. He backed up a few yards. ‘Wait till a tell yer fancyman ’ow daft y’ look in them fishin’ togs. ’Es waitin’ for yer back at ’ouse. I’ve attempted a Yorkshire dialect this week, with all it’s dropped letters and old-fashioned sounding words like thee and thou – or abbreviations of them. In speech, some words are just missed out altogether, the meaning of the sentence left to the reader/listener’s powers of deduction (or imagination!). The dialect contains many words derived from the Norse – a reminder of the time between the 9th and 10th centuries when Yorkshire was a part of the Danelaw, initiated in the late 9th century by Alfred the Great. My very favourite person! Great use of dialect, Millie. 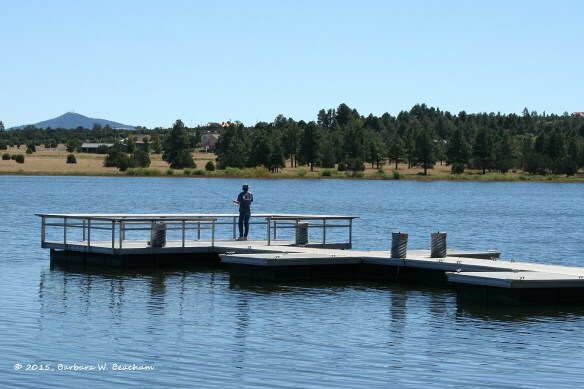 I bet Brenda could prove that girls can be just as good at fishing as boys if she wanted to! Oh, I’m sure she blinkin’ well could! I love the use of dialect. It adds so much to the story. Great story and I enjoyed the dialogue! I enjoyed your tale tellin’ there Millie, man fishin’ gotta be tha only way with them girls outa the way. I could hear the yorkshire lilt while reading. Now I want to go wandering north again. I have that problem when I’m annoyed – suddenly my queen slander accent is thick as they come. I am Australian, it would be unpatriotic not to swear. Ah . . . that’s different, then. And it puts you on a par with Yorkshiremen (and women!). Ah, yes. Fred Trueman sounds just like my husband, especially when he’s feeling grumpy. He’s a true-born Yorkshireman. Thank you for liking my post, John. All creative works copyright © Millie Thom, 2014. Unauthorized use and/or duplication of this material without express and written permission from this blog’s author and owner is strictly prohibited. Excerpts and links may be used, provided that full and clear credit is given to Millie Thom with appropriate and specific direction to the original content.